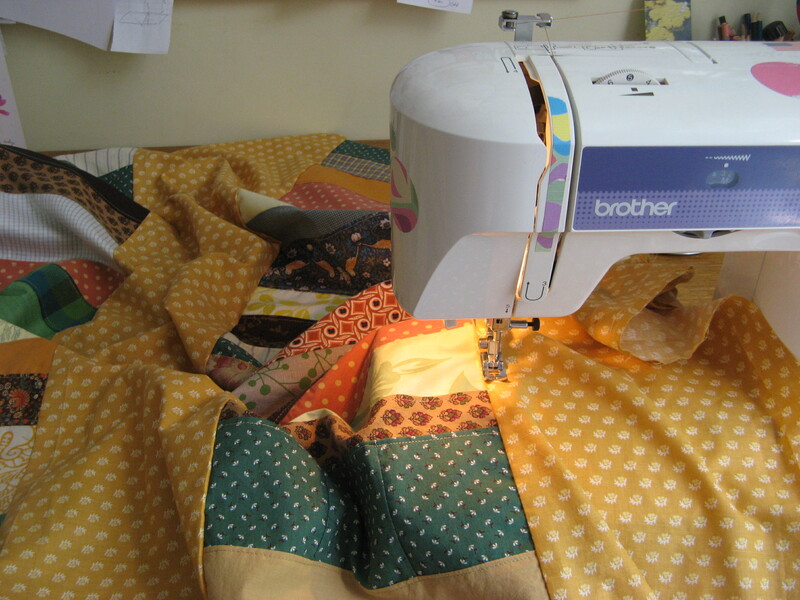 This summer was the longest break I’ve taken from quilt-making since I started. Maybe it was the effort of producing a queen-sized piece. Or maybe it was having my kids around for summer. Whatever it was, at some point I thought I should make a quilt for my mother. She said yes she would like that, and this project ensued. She wanted yellows, greens and browns. I gathered stuff from my stash and she gave me a bunch of old fabric from her attic, including what I recognized as curtains that had been in her kitchen long ago. 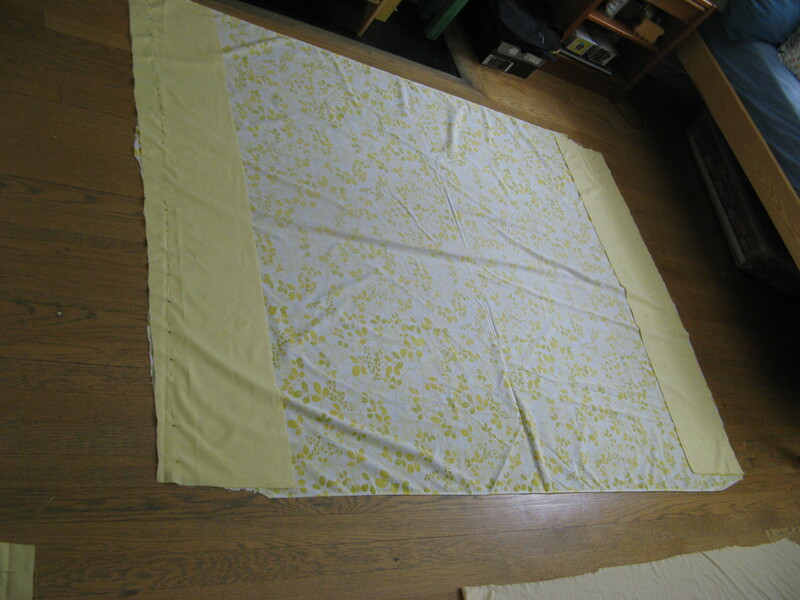 There was also fabric from seat cushions she made for the kitchen chairs. It was fun to see this in its original color saturation — compared to the well-worn cushions which are still there. Best of all, there was a very cheery and flowery yellow bedsheet, the sight of which caused me to bury my nose in its familiar smell. I remember going to her room early in the morning when she was in bed reading before my brother woke up. I’d climb in bed with her and we’d talk or read and play shadow puppets with the light from her bedside lamp. My mother’s bed is her refuge. And it was the secure station where she hunkered down to sleep and wait out six months of radiation and chemotherapy to vanquish a soft-tissue sarcoma. 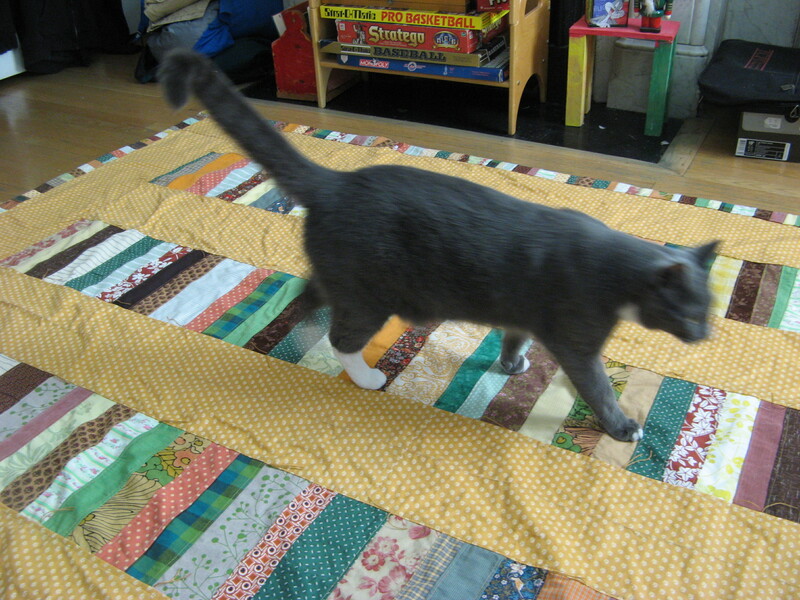 She cares deeply about what she puts on her bed, so I have been privileged to make a quilt for it. Her instructions on a white slip of scratch paper include her classic "Q." 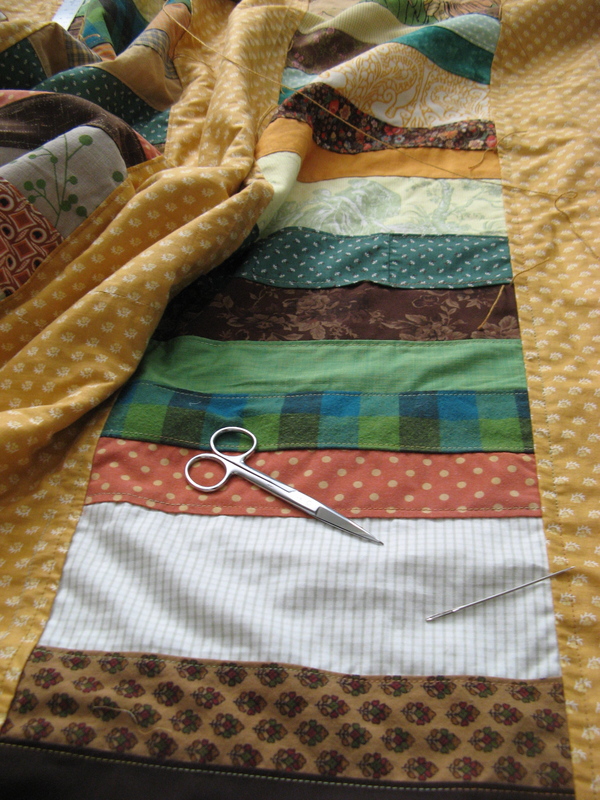 The pattern inspiration for this quilt is one I’ve done several times, the so-called Chinese coin pattern. 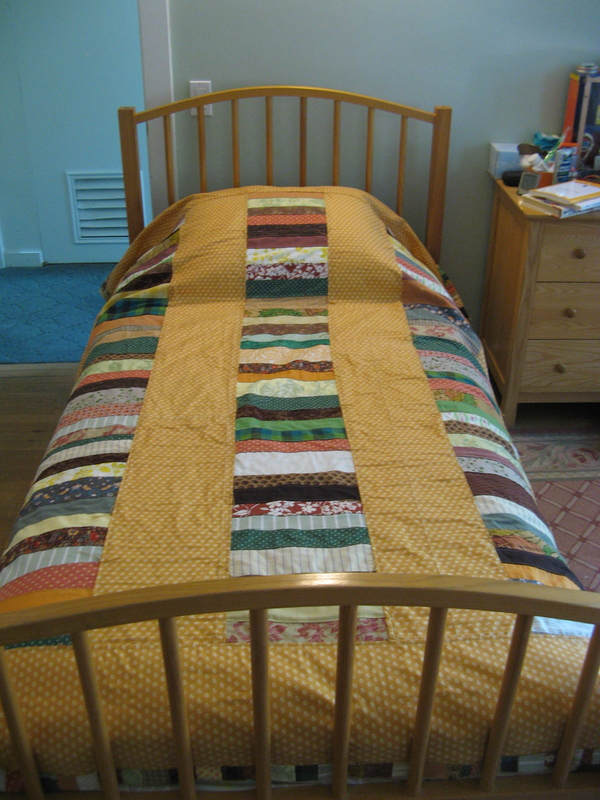 Ignore the unmade bed and you can see the basic pattern: stacks of narrow horizontal strips (coins) alternating with typically a solid color background. 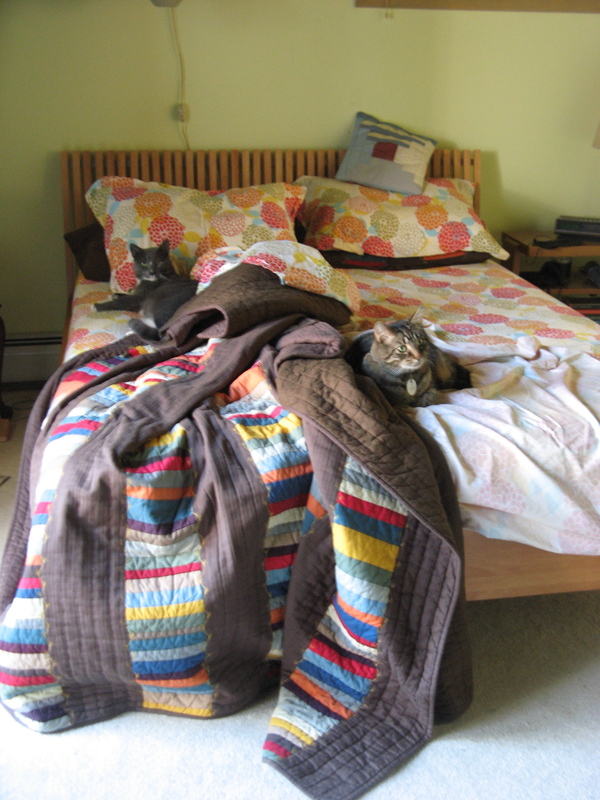 If the bed's not made as soon as it's vacated, felines will take advantage of any remaining warm spots. From a production standpoint, this pattern moves along readily. I googled to discover the origins of the "Chinese coin" but didn't find anything I felt was sufficiently authoritative. It is also called "strip piecing." 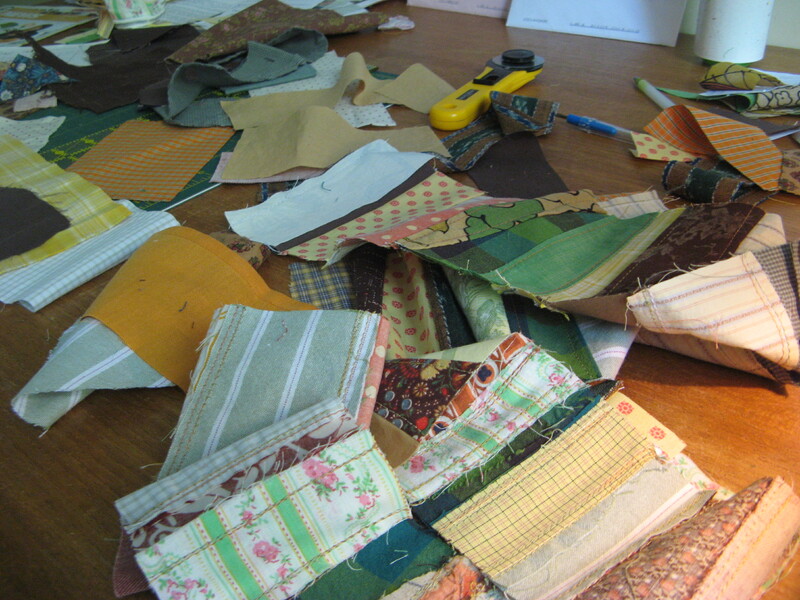 Selecting fabrics and grouping them together is the fun part. I end up using a far greater percentage from my own stash than from those my mother gave me, and I realize these may be unconscious choices recalling her fabric history. For instance, the deep blue/greens below are nearly the same color as a fabric she used to reupholster a living room chair — a project she never did finish, though the chair remains with a slipcover. The blue-green was the lining for a toddler-sized jacket. There are also old pillow-cover pieces here. 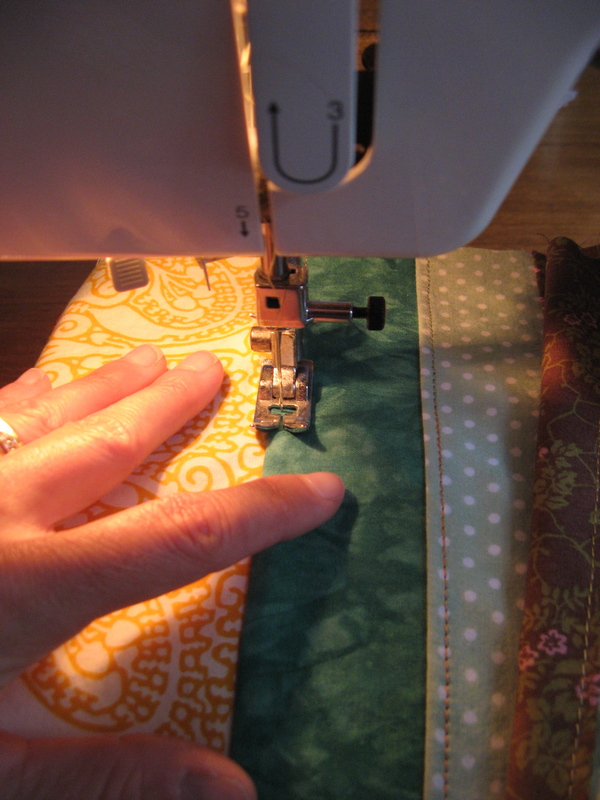 I also sew narrower but longer rows for an outer border. This should stand out nicely against the brown dust ruffle on her bed. My son's bedroom floor is my surface for laying, arranging and visualizing. 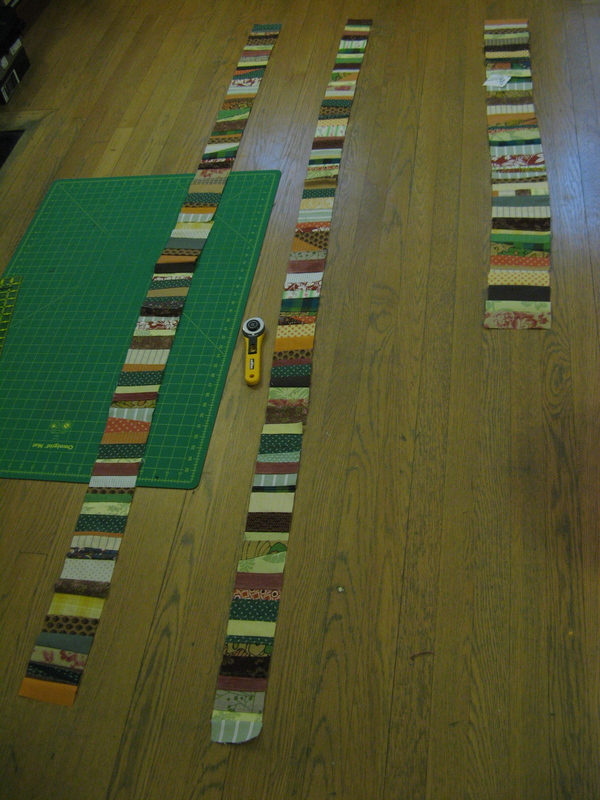 I believe some quilters use an "idea wall" but my workroom does not offer enough space to stand back and view. 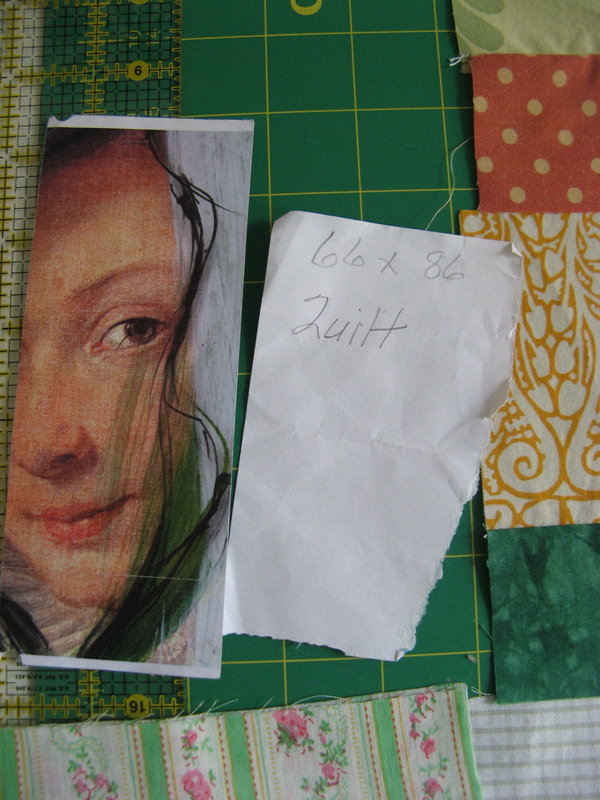 Once columns are done, a background color is needed to highlight and divide them. This offers the perfect application of those former kitchen curtains. It’s not a solid, but the pattern is small and neutral enough to work in. The warm hue of the curtain material puts me in mind of acorn squash. Or maybe it's a fall breeze in the air. I like making ready progress on a project, but the bigger it gets the harder it is to move around. 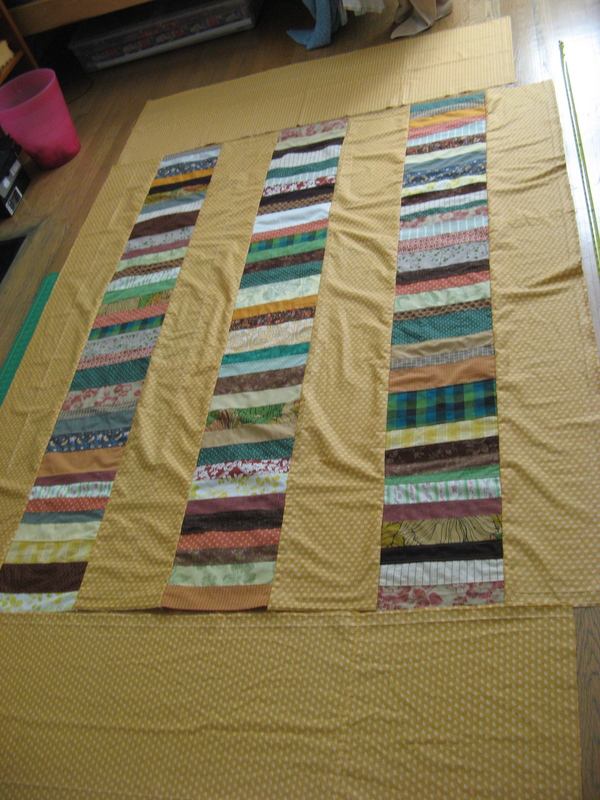 After the alternating columns of strips and solids are sewn together, the solid is added to cap the top and bottom. Wide borders emphasize the colors. I think a very dark color, like black, would also work well here. Yellows always remind me of my mother. I usually hand-tie my quilts. For this I use a needlepoint thread which perfectly matches the acorn squash color. Nearly there. A quick check of photo dates shows this commenced August 5 with fabric selection, and sewing starting September 10 and finishing September 22. After a quick look over by the resident inspector, it’s done. Don't worry about soiling: Seymour keeps his paws and pads scrupulously clean. Not a bad project for Modest Machine to limber up after the lay off. And now I have officially queen and twin sized quilts under my belt. I do take commissions, and if you’d like to know more, leave a comment and I’ll get back. Caio for now!